General Hospital (GH) spoilers for the week of February 11-15 tease that some surprising encounters are in store. First, Dr. Griffin Munro (Matt Cohen) will get a visit he wasn’t expecting. Ava Jerome (Maura West) will also show up just in time to help someone, so perhaps she’ll inadvertently derail Ryan Chamberlain’s (Jon Linstrom) plan to kill Griffin. Meanwhile, Shiloh Archer (Coby Ryan McLaughlin) will get a shock as well. Drew Cain (Billy Miller) will corner Shiloh this week and perhaps suggest that they should get a few things straight. GH viewers know Drew’s focused on his son right now. Oscar Nero (Garren Stitt) is dying, so Drew may want to make sure the sick teen is left alone. Drew may also be concerned about Sam McCall (Kelly Monaco) being in Shiloh’s orbit, but that’s only because she’s scheming. General Hospital spoilers say Sam and Shiloh will spend most of Valentine’s Day together, but not all of it. Sam will carve out some time for some steamy moments with Jason Morgan (Steve Burton), so he should appreciate that. Over with Cameron Webber (William Lipton), he’ll land in hot water over something. Perhaps Cam will act out due to Franco Baldwin’s (Roger Howarth) predicament. Elizabeth Webber (Rebecca Herbst) will also make a bold move by pushing for a rushed marriage. She’ll want to make Franco her husband ASAP, so they’ll tie the knot while Franco’s in lockup. 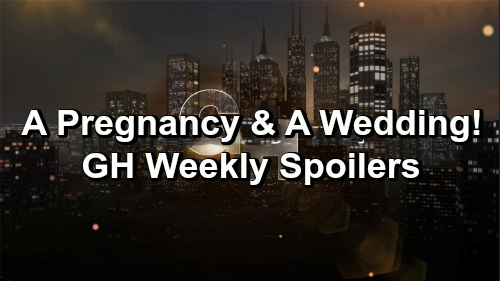 Other General Hospital spoilers say a surprise pregnancy announcement is on the way. Which happy couple will spread the good news? Jordan Ashford (Briana Nicole Henry) and Curtis Ashford (Donnell Turner) still seem like the best option. Elsewhere, Spencer Cassadine (Nicolas Bechtel) will head back to Port Charles and get some advice. Sonny Corinthos (Maurice Benard) will nudge Spender toward doing the right thing. Will Spencer come clean to Laura Webber (Genie Francis) about his election tampering? Next, Kristina Corinthos-Davis (Lexi Ainsworth) will find herself feeling jealous. Part of her will like the fact that Sam’s seemingly opening her heart and mind to Dawn of Day. Another part of her will be envious of Sam’s growing bond with Shiloh. General Hospital spoilers say Nelle Benson (Chloe Lanier) will contact Michael Corinthos (Chad Duell) again. Brad Cooper’s (Parry Shen) fears will grow when his partner in crime stirs the pot. Across town, Valentin Cassadine (James Patrick Stuart) and Nina Cassadine (Michelle Stafford) will have a romantic evening. They’ll grow closer as they prepare to wed, but big trouble’s brewing. That’s because Sasha Gilmore (Sofia Mattsson) is back in town and she’s not taking orders from Valentin anymore. Sasha will go rogue when necessary, so Valentin will have to watch out. For now, Sasha will be focused on Griffin and his pain. She’ll see how much he’s hurting over Kiki Jerome’s (Hayley Erin) death and try to help out – could a new romance be brewing? General Hospital fans will want to check out the hot episodes airing on new GH episodes, February 11-15. We’ll give you updates as other GH details emerge. Stay tuned to the ABC soap and don’t forget to check CDL often for the latest General Hospital spoilers, updates and news.